On your mark! Get set! Go! These were my thoughts on Friday as I spontaneously decided to make a hot meal to distribute on the streets of East Palo Alto the next day. But what could I make that would be enough to feed anyone that we saw hanging out on the streets? Then it came to me: Enchiladas, Spanish rice and beans. Those would be good, but I only had three hours to prepare before I had to pick the kids up from school. And so the race began. Without a home for Lauren’s House, I raced back to my home in Hayward, with a stop at Wal-Mart to get supplies: tortillas, aluminum pans for the enchiladas, rice, beans, enchiladas sauce and a large onion. Praise God, I purchased cheese from Costco earlier in the week. First I started the spanish rice. While that cooked, I washed the beans and seasoned them up. Last, I got the electric griddle out to heat up the tortillas. Now the fun part begins– dipping the tortillas in enchilada sauce and stuffing each enchilada with cheese, onions and olives. Saturday afternoon, after heating up the food and packing it into a to-go container, Lauren’s House participants piled into our van and went out to find anyone that might be hungry. We found 18 people on the streets of East Palo Alto who were hungry and/or homeless. With every stop, kids hopped out the car with the rush that comes with helping someone. One by one each plate was handed out until there were no more left. 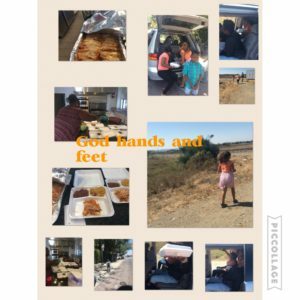 Another God’s hands and feet project down, a lifetime more to go!